Welcome! On our site, you will be able to find out information about anything you have ever wanted to know about that space below your home known as a crawl space, the problems it can experience, and the most effective ways to go about treating the situation. Here, you can find out why your home smells musty, why there are un-even or sagging areas on the first floor of your home, or even why you have been experiencing skyrocketing energy bills each month. We will detail different methods and products used to take care of moisture, humidity, and mold problems, and if after you have read through everything you feel as if it is time for a professional to step in and take care of the work, we are here to help you track down a local contractor doing work in your neighborhood. 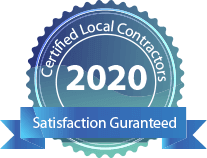 Our crawl space repair contractors are certified, insured, and have years of hands-on experience taking care of moisture, mold, and humidity problems in countless homes over the country. They will be able to provide you with a FREE consultation and estimate so that you can get a better idea as to how much the project will cost, and what exactly will be involved in the repair process. We will be able to provide you with a profile of each member we work with. We have local crawl space repair contractors all over the United States. Take a couple of minutes to browse through our information regarding some more common crawl space problems and some easy ways they can be taken care of. You can try these repair techniques on a DIY basis, but if the problem doesn’t go away, it will be a good idea to fill out our online contact form to find a contractor in your town who can help you with the problem. What Crawl Space Problems Are You Seeing? Installing wooden floor over a crawl space will expose the wood to moisture from the ground and humidity from the air in this area of your home. Eventually, these wooden materials may start to rot, warp, and decay, eventually causing sagging areas on the first level of the home. The interior wall panels or drywall panels of the home over the crawl space can be effected by crawl space moisture and humidity. The moisture can cause the panels to warp and rot, while the humidity can be a contributing factor to dangerous mold growth on the walls. This is the outside area of the crawl space that you see from outside of the home. These walls may not show much damage from the outside, but on the inside, they may have mold or efflorescence growing on them and causing problems. 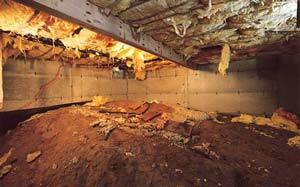 Often times, builders use inferior quality insulating materials inside of the crawl space when it is being built. It is important to have the proper insulation in place to provide a comfortable environment inside of the home. If you have clogged gutters or a downspout that doesn't extend far enough away from the crawl space, then moisture may build up next to the exterior wall and eventually make its way inside where it can cause a variety of damage. This is a white, chalky, and flaky substance that grows inside of your crawl space on the walls whenever moisture is present. It can be a result of ground water or seepage through the exterior wall. This is the base of the crawl space structure which helps, in part, to support the load of the home. Damage here from moisture in the ground can cause serious damage for the structural integrity of the entire building. This is the area where the footing and wall joint meet. This area can easily be weakened by excessive moisture and humidity inside of the crawl space. 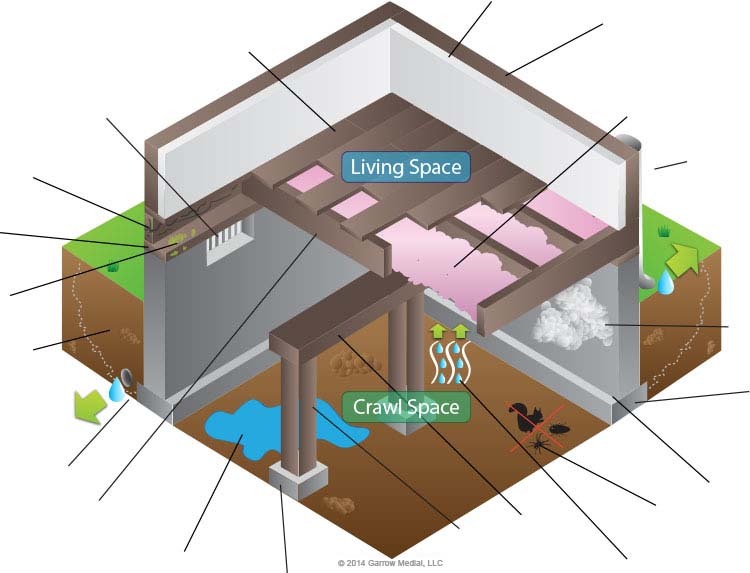 When a crawl space isn't sealed off from the outside environment, critters, including: termites, roaches, spiders, snakes, rats, mice, skunks, and raccoons can take up residence below the home. They will eventually live out their entire life cycle here and the rotting dead animals can cause your home to smell very bad. When the crawl space isn't properly sealed off, humidity will be very high underneath the home. Humidity is measured by the amount of moisture in the air. This moisture can eventually lead to the growth of dangerous mold and mildew, and also weaken the wooden structures beneath the home. The girder of the crawl space is the center beam which helps to support the load of the home. When there is moisture here, it can cause the beam to become very weak, fragile, and unable to support the weight of the home properly. You may notice that you have sagging areas on the first floor of your home when you have a problem with the girder. The pier is another item that helps to support the weight of the home. It can also be damaged by moisture and excessive humidity levels in the crawl space. The pier footing is what the pier itself is situated on top of. When the soil conditions in the crawl space are unfavorable, such as being very soggy from abundant moisture, the footing can actually sink further and further into the earth. Moisture can get into any crawl space that isn't properly sealed off. This moisture can cause serious damage to all wooden structures, including support beams, floor joists, and more. Additionally, this moisture can lead to the growth of dangerous mold which could make your family really sick. It also attracts unwanted pests, such as mosquitoes and termites. This is the area beneath the first floor of your home. It can become very weak and fragile whenever moisture and high levels of humidity are present. It can cause the first floor of the home to sag whenever there is a problem in this area of the crawl space. This drain can help to re-direct water from around the crawl space to somewhere far away so that it doesn't built up next to the walls and seep inside. However, this drain could become clogged with debris and dirt over time. Whenever the backfill around your home wasn't properly put back into place, you can have problems with soil erosion from excessive moisture. All of this moisture in the ground will eventually make its way into the crawl space and cause a lot of damage. Mold will grow whenever moisture, high humidity levels, and organic materials are present to feed off of. These conditions are often found inside of an un-sealed crawl space environment. Floor joists will start to rot whenever moisture in the crawl space is present. All of this water weakens wood and causes it to deteriorate. This can cause sagging in certain areas of the first floor of your home. This area is found between the floor joist and the exterior wall of the crawl space. This spot of the home can easily start to rot whenever moisture or high humidity levels are present. A crawl space vent can be open or closed, and sometimes this is the main culprit behind high humidity levels inside of this area below the home. What Crawl Space Problem Are You Seeing? 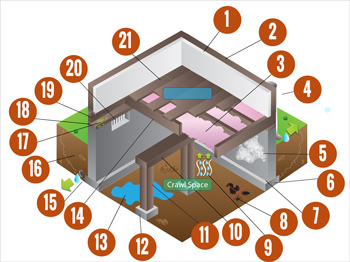 Crawl Space Moisture Management: moisture here can lead to mold growth and wood rot. To take care of the problem, be sure that you have proper interior and exterior drainage with the crawl space so that water cannot simply pool up and lie stagnant. If the CS has vents, be sure that they are not the cause of the moisture problems underneath the home. Pest Control: reducing the humidity under your crawl space can help to prevent wood rot, and thus reduce the number of unwanted pests living under the home, such as termites and roaches. A dehumidifier can be installed to lower the amount of moisture in the air. Carbon Monoxide Safety: vented combustion appliances should not be installed in a closed crawl space as this can lead to a build up of dangerous Carbon Monoxide gas below the home. Check the appliance's warning labels to make sure that it is safe for the environment below the home. Fire Safety: a fire-rated caulk can be added around the plumbing, wiring, ducts, and electrical components in the crawl space to help with preventing damages relating to a fire. Insulation: wet fiberglass insulation will need to be replaced with spray foam or some type of blown-in insulation which will not foster the development of dangerous molds or mildew. Radon Control: this dangerous gas can seep up through the ground, through the crawl space, and into the home. Installing floor liners will prevent the gas from coming up through the earth. Have a More Comfortable and Energy Efficient Home: be sure that crawl space vents are properly sealed so that conditioned air from inside the home can’t get out, and so that outside air can’t get in. This helps to prevent HVAC units from working overtime to keep the home comfortable throughout each season of the year. Prevent Mold Growth: be sure that the levels of humidity are controlled underneath the home with a dehumidifier, and be sure that excessive amounts of moisture aren’t able to get inside. Sagging Floors: these floors could be leveled once again with the use of crawl space stabilizers beneath the weakened floor joist. However, rotting wood below the home is a sign of moisture and humidity – things which should be investigated by a professional. Dead Animals and Odors: dead animals and bugs underneath the crawl space will need to be removed to help eliminate any foul odors that are noticed inside of the home.